Of all the blocks in the world that I could make, i would probably do just about anything to avoid making log cabins. I find them so tedious! Inevitably, though, log cabins are requested at least once in each swap. Sometimes, multiple times. And so I make them, because I want my swap partners to be happy, and to enjoy what I send them. Lisa was actually the queen for August in the Scrappy? Sew Bee It! Swap, but I fell behind, and then just avoided making these. But I got my stuff together tonight, finally. Mostly because fabric from the October queen in the Fat Stash Bee arrived, and I realized that I would be perilously close to being two months behind. And that just wasn’t acceptable – I’d been up to date until the beginning of the fall semester. Anyway, I got my tush in gear, and made two. Lisa requested these in any colors we wanted. I decided to return to my favorite standbys of gray and chartreuse, and then to make one in my new favorites of raspberry and tangerine. 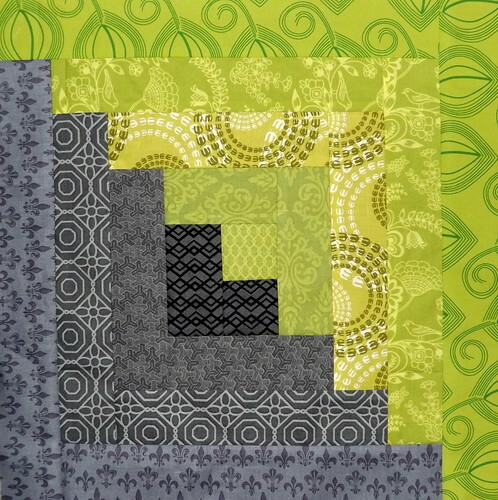 Of course, having made that chartreuse and gray block, I have this urge to run and buy as much fabric as I can in this color – it’s desperately low in my stash. It was actually kind of a challenge to come up with enough fabrics in that particular shade. 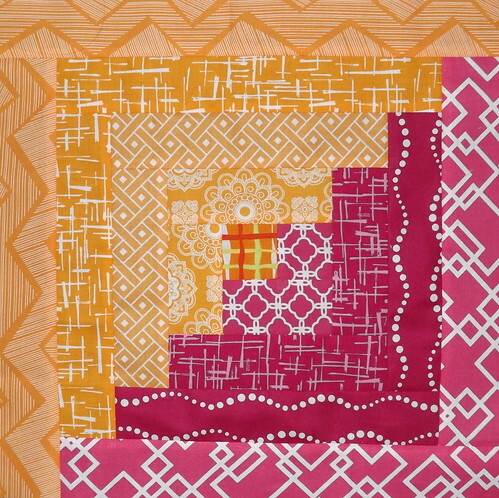 Tomorrow, it’s time to make some more of October’s blocks, and then I can return to Swoon blocks. Tags: August, Scrappy? Sew Bee It!